On the First Monday and Wednesday of each month, Lily travels to Keyport Library for the Reading to Lily Program. The program begins at 10:45 am on Mondays, and 3 pm on Wednesdays. Each session begins with hugs ane kisses for Lily, then Miss Chris reads a book to the children. After the reading, there is a craft that coordinates with the story that was read. Before the program ends, some of the children read their favorite story to Lily. Lily likes books about cats and dogs the best! Reading aloud is fundamental in learning to read and developing language skills, but children may become intimidated when reading aloud, and the other children may snicker or laugh if mistakes are made. Even if they don’t, the fear that they will exists in the child’s mind. Studies have shown that reading to a dog is beneficial, because dogs are non-judgmental. They sit and listen, and never laugh or giggle. Lily will sit there as long as the child wants. It’s her gift. Miss Chris had read about these benefits, and began looking for a therapy dog to bring to the Keyport Library. However, all the therapy dog programs she called were not available in our area. 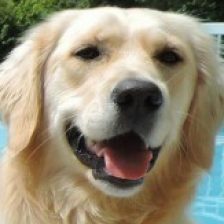 One day, Lily and her handler arrived at the library to introduce themselves to the staff. Miss Chris was very interested, and the Reading to Lily program was born. Over the months that Lily has attended this program, the children have grown to love her and welcome her. Sometimes they have to be reminded to listen to the reading, because they love Lily so much that they get slightly distracted hugging and petting her. What a problem to have! One of Lily’s favorite books is Go Dog Go. The children giggle at all the places the dogs go in the book, and Lily gets excited when they have their party in a tree. She also likes Pete the Cat and his adventures. We are hoping to become involved in more “Reading to Lily” programs in our area. We will keep you posted as details emerge. 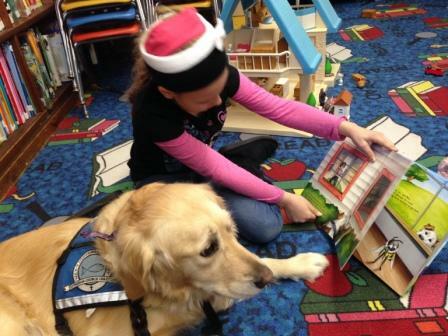 Do you have a Reading to a Dog Program in your area? Tell us about it in the comments, below. We’d love to hear from you. I so enjoy reading these stories that follow the adventures of Lily.. She was doing a reading program at about four months old. It encourages me to keep doing what I do with this wonderful ministry and all the special dogs that are in the program. Thanks Marianne. Thank you, Terry. Lily is loved by so many folks, young and old, and every time she is out I am reminded of her training. Her behavior always amazes those we visit, and we usually end up talking about her early training. You and the other LCC Trainers are to be commended. Please keep up your good work!